India's 14th President Ram Nath Kovind | Ram Nath Kovind wins race to Rashtrapati Bhavan with 66 percent votes | India Today News Report : India's 14th President Ram Nath Kovind, once sworn-in on July 25, will be the second Dalit President of India after KR Narayanan. 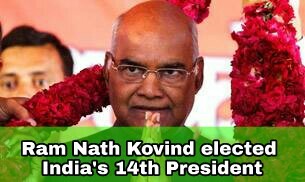 After final round of counting, Ram Nath Kovind got 7,02,044 votes out of a total of 10,69,358. His opponent and former Lok Sabha speaker Meira Kumar won 3,67,314 votes.